Did you hear about the recent policy changes that could affect your retirement (no matter how far that is away!)? From new Stamp Duty policies to new superannuation policies, these could mean changes to your current and future property investment decisions. We want to make sure you know what these changes, the opportunities created as well as avoiding the risks involved. Australians aged over 65 who sell their home which they have owned for over a decade will be able to put up to $300,000 in sale proceeds into their superannuation. This incentive to downsize will help free up larger homes for families to move into and offer the sea change lifestyle they might be looking for. Investors who previously has travel expense tax deductions related to their investment property will no longer be able to make these claims, even if travelling to collect rent, maintain or inspect a premises, they will not be allowed as tax deductions. 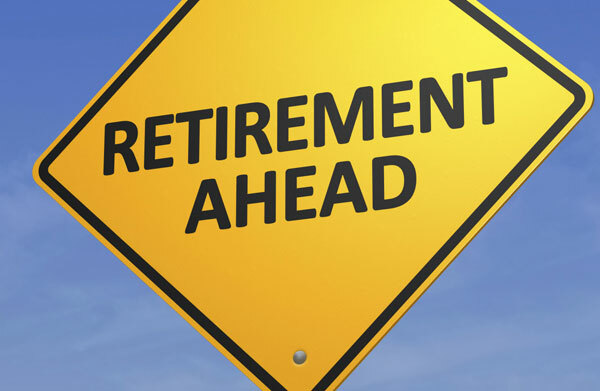 New Superannuation “transition to retirement” rules have been implemented and there is no longer a compulsory retirement age. Access to your super depends of your super preservation age between 55 and 60 and the age pension age has been increased from 65 to 67. The new super saver scheme will allow first-time home buyers to put up to $15,000 a year, to a maximum of $30,000 into their superannuation. These funds can later be withdrawn for a home deposit, including any earnings the deposits have made. This means a tax incentive to save more, and can be taken advantage of as a couple with each claiming $30,000. For more information of changes please visit your local government’s website. When preparing your property for sale your pre-market check list is an important step in ensuring your property presents in its best light at your open to the public days. From general maintenance to renovations, de-cluttering, cleaning but one thing often overlooked is home staging and styling, proving extremely popular with property sellers around the country. A staged / furnished property can help your property outshine the rest in both home opens and appearance in photographs for web and portal advertising. Getting assistance from a professional property stager could ensure your property reaches its full potential and help get you the asking price you want. Neutralize the wall colours – There can be no talk about any decor without neutralizing interior/exterior coat of paint and bringing it up to date. Remember that the palette needs to coordinate with the fixed elements of the house, like the roof, the brick, and the stone. Alluring scents – A nice clean fresh scent throughout the house is the most important thing that will keep the potential buyers inside for longer. Scented electrical plug ins, essential oils, diffusers are easily accessible on the market and are always a bonus in the house presentation. 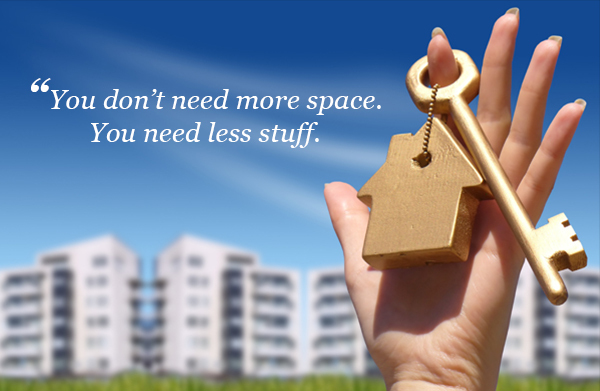 Less is more – Pack up and store everything that is not needed and is just creating unnecessary clutter in your home. Even if you don’t have a storage place or an extra shed, packing your surplus stuff into storing containers and placing them nicely and neatly into one corner of your garage will still look better than having it clutter the space throughout. Accessorizing – Color-coordination is the key! Pick a few main colors from your wall art and make it “flow through the space” in the shape of color-coordinated decorative cushions, throws, vases and decorations. Size does matter – If your sofas are too bulky, tables oversized or you have that extra armchair that is so comfy but not needed in the living room, it is better to pack it up and store it and replace it with the furniture that won’t overtake the space. Layering the light – Adding floor and table lamps in those dark corners will set the mood and create a comfortable feeling in any room. Selling lifestyle – Place a cookbook near the stove, your best dinnerware on the table, put a few glasses and a juice jug together with a magazine or your favourite book in the alfresco area. 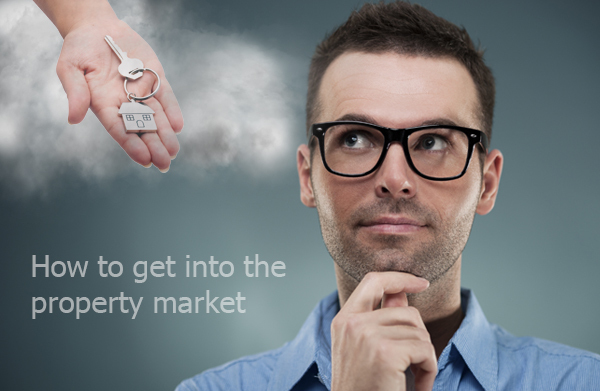 The potential buyer wants to be attracted by the lifestyle that your property can potentially offer. 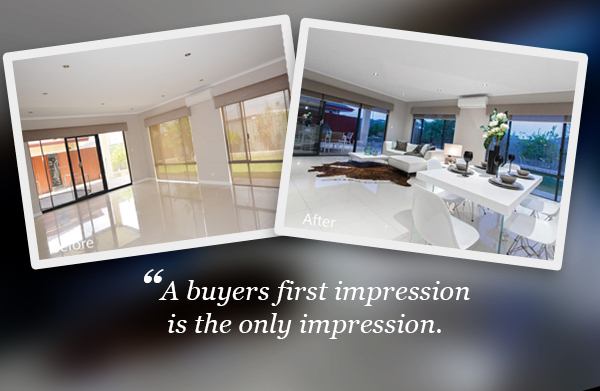 Professional home stagers like Perth Staging complete an initial, objective property inspection. They will assist you with your budget to freshen up key spaces in anticipation for sale. As a homeowner you can save money by completing the packing and cleaning and minor repairs yourself. But when it comes to the final showcase part of staging the property, it’s better to leave it to the pros. An educated, well-skilled staging professional knows how to style a room to address what the buyer needs to see, how to highlight the best features of your house and how to minimize its less desirable attributes. Stagers also know how to maximize space by using correct placement of color, lighting and art to harmonize a living space so the buyer connects on every level and makes an offer. Even if you decide to do the home staging yourself, with your existing set up, but would just like some guidance from a professional stager towards the do’s and don’ts of the home presentation. One bedroom apartments have always been a point of contention among investors in the property market. Affordability factors and changing lifestyle preferences are now seeming to give these a real edge in Australia’s every changing current property market. Research is showing a one-bedroom apartment in a good inner city location which is close to transport, employment and lifestyle amenities cans outperform a two bedroom apartment in a outer fringe location without the same amentities. A one bedroom apartment can also get you into the market if you want to buy in a desirable area, close to the CBD and transport. There is also lower upkeep costs for smaller apartment and negotiating finance for one-bedroom units is certainly becoming easier with the banks. According to some property commentators, there is greater tenant demand for small units, as the trend is moving to inner city locations for lifestyle choice which is boosting prices for one bedroom apartments. 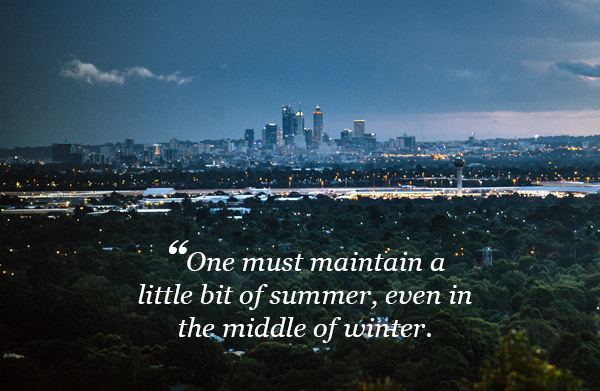 If lifestyle and inner city living is your focus, there are more than just apartments with one bedroom. One bedroom townhouses and villas, especially in older established areas in major cities are available. Old workers cottages and small terraces could be a great way to renovate and add value to as an investor and you may be able to even extend the property down the track. Apartment buyers need to remember that these days demand for land isn’t the same as it used to be driving the residential property market. Many people are out to buy or rent lifestyle and are prepared to make the necessary trade offs just as living in a smaller space to live in a premium location. Property buyers today whether investors or owner occupiers really are looking for somewhere to live that is conveniently located and packed with amenity and one bedroom apartments fit this mould. A break in can have effects much more than just your property – unsettling your peace and the feeling of security in your home. There are simple and effective steps you can take to reduce your home’s risk of invasion, whether you’re away on holidays or staying at home. Burglars will get into your home via doors and windows, so ensure they are fitted with visible (and sturdy) locks. If looking to renovate or building, ensure you have thick, solid doors that will be hard to kick in. If your doors have a window, install a secondary floor lock for extra security. It’s amazing how many people fail to lock their doors. Its common sense but lock up every time you go out, but also keep the doors locked when you’re home especially at night. If you leave screened doors and windows open ensure you have good locks and use sturdy screens. A home alarm system is one of the top ways to deter burglars from targeting your home. If you do have a home alarm system make sure it is visible and your alarm company has a fast response time. You may also wish to consider whether you want the police automatically notified of an alarm event. If you have a hidden front entrance or side access to your home these can attract burglars as it provides privacy when they are trying to break in unobserved. Easy ways to deter them are to have motion activated lights or sensor security lights for visibility at night. You can also trim trees and hedges to create visibility from the street or install lights on a timer at the front of your house (such as walkway or front porch lights) to create the illusion of being home. Rubbish that shows recent large purchases such as new television screen boxes and lots of mail signifying you’re away on holidays are easy identifiers for burglars. Hide your bins away from the street front when it’s not collection day and consider mail redirection or a friend collecting your mail when away. Protect your valuables just in case theft does happen. Have precious valuables safely secured in a safe. Mark all your valuables with engraved identification and photograph valuables to ensure you keep your contents insurance up to date. In general, following these tips and daily habits such as keeping curtains and blinds closed on the ground floor helps to deter burglars as they can’t assess your property’s value or determine whether you are home. 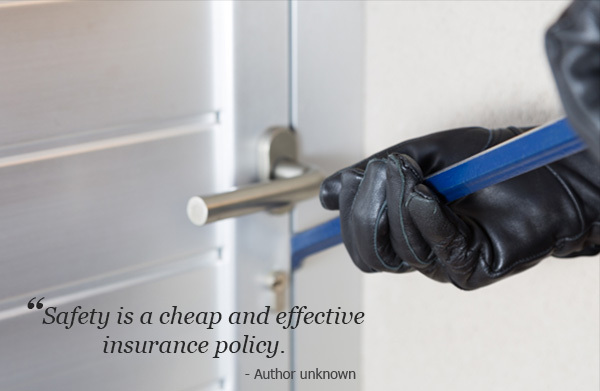 By taking a few key precautions you can keep your home safe and secure.